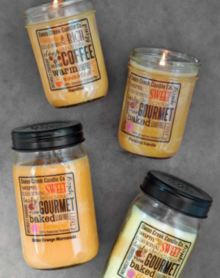 Intense fragrance, Clean Burning, Lead Free KITCHEN PANTRY JARS.The largest holds more than 24 ounces of clean burning soybean wax in rich assorted colors, 12 ounce jars complete your options. Label is easy to remove for a cleaner look. These containers are made in the USA. Candle wax, all American! Choose from many kitchen fragrances or our clean and fresh fragrances.